Iceland's dramatic landscapes make it a drone pilot's paradise. With such a variety of geography, there's plenty to see and film which is why AirVuz put together a compilation of drone videos of this Nordic country. The Golden Circle is a 300km route where you’ll see most of the famous sights in Iceland like the Blue Lagoon, the Great Geysir and thousands of waterfalls! 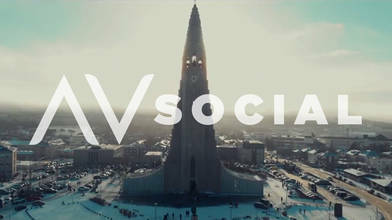 Drone footage of Iceland’s capital Reykjavik, black sand beaches and giant glaciers are also included in this aerial production. Iceland's DRAMATIC LANDSCAPES make it a drone pilot's paradise. With such a variety of geography, there's plenty to see and film. The GOLDEN CIRCLE is a 300km route where you'll see some of the most famous sights in Souther Iceland. There are hundreds of different tours going on every day of the week. The BLUE LAGOON is a geothermal spa that's popular for bathing because of its mineral rich waters. It's the perfect place to relax and unwind. In Iceland's capital, REYKJAVIK, you can stroll through the old harbour, visit a museum or take in the view from the historic Hallgrímskirkja church. Reykjavik is also the world's northernmost capital city. Iceland is also known as "The Land of Fire and Ice." You could walk on a VOLCANO and take a GLACIER tour in the same day. Talk about polar opposites. Basalt lava from volcano eruptions have created amazing spots, like the world famous REYNISFJARA BEACH. You won't believe it until you see it. Iceland is also a geyser hotspot and home to THE GREAT GEYSIR. Watch boiling water shoot up to 70 meters high. It was also the first geyser described in a printed source and the first known to modern Europeans. ADVENTURE is waiting in Iceland. When are you going? To see all of the videos featured in this aerial compilation, CLICK HERE!